Our first I-AM Session, The Business of Colour, looked into how colour affects our experiences from the perspectives of three disciplines: trend forecasting, neuroscience and food retail. A major influence in how we make sense of the world around us is through our understanding of colour. Colour has the ability to powerfully control our perceptions, change our minds, actions and emotional state. By recognizing how colour physiologically and psychologically influences us, we are better able to create desirable atmospheres in our work, home and social environments. Stylus Colour Forecaster, Catherine Bedford opened up the evening by talking about how the power of colour forecasting is not hocus-pocus and crystal balls, it is about looking at the world around you. It is not about telling you to use lime green or pink for your catwalk shows in 18 months. Colour forecasting for designers is about informing about what the big colour themes are going to be for the next 2-5 years. Catherine told us that it isn’t always about looking forward; you must also consider your past. Industry develops through digital and 3D printing with the introduction of even more tactical materials has meant designers can utlise colours in a more explosive way. Work by artists such as Eyal Gever and Mark Mawson are making their way onto designer mood boards. Professor Charles Spence of Oxford University has worked with chefs from a range of backgrounds including the ‘experiential chef’ himself, Heston Blumenthal. As a neuroscientist, Charles looks at how the brain works and communicates, how the brain informs us about the direction to design foods, products and the environments in which we socialise. What would the experience of eating be like if you lost your sense of colour? When Charles asked us, it was difficult to imagine; but he showed us images by colour-blind artist Charles Jones who created pictures bleached of colour to reflect the way he viewed the world. The food depicted in the images appeared wholly unappealing ad demonstrated the importance of colour in the allure of foods. Would a green steak taste as good? With the help of our I-AM session chefs we were treated to some spectacular food as Charles explained how certain colours such as red can make us think something is sweet and green, sour. Our plate of sweet black rice might not have looked at all appetising but it definitely challenged our senses. For pudding, we were treated to bowls of delicious chocolates. Some bowls had lots of different coloured chocolates while others were bowls of only pink, blue and white… little did we know that this experiment demonstrated how we eat more when presented with a wider variety of colours! Ah, the secret as to why you keep tucking into those M&M’s! Professor Spence’s talk taught us how we attribute so much meaning to colour…the colour ultimately determines the experience. 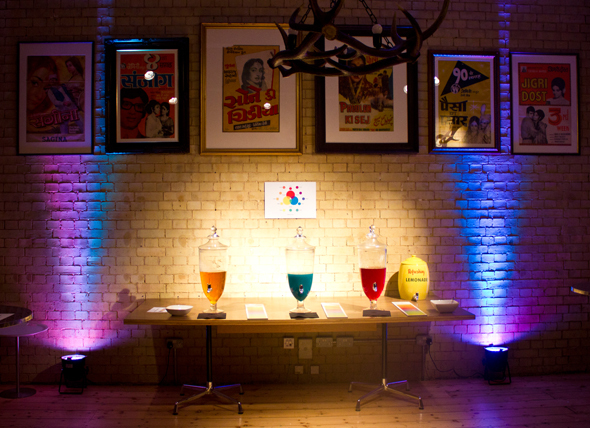 “We think Colour, or as we like to call it, Vibrancy, is at the very centre of everything we do!The charismatic Founder of Chilango Eric Partaker, explained that colour, or as they call it vibrancy, is the centre of everything they do. Vibrancy became an epidemic. Everyone at Chilango knows the ‘food, people, place’ mantra. These are the three things any guest comes into contact with… the three things that combine to create the best customer experience. Eric concluded that the result of the ‘Vibrant Outbreak’ has meant they have received over 30,000 pieces of positive feedback and Chilango is often referred to one of the most widely talked about and reviewed restaurant groups in the space. 11/12 - Chilango London Wall opens today! 25/10 - Kale Kilit nominated at WAF 2012!